Classic Sony titles will be getting the royal limited edition Blu-ray treatment from Twilight Time in the upcoming months. Specialty label Twilight Time has struck a deal with Sony Pictures Home Entertainment to license and release classic films from the Sony-owned Columbia Pictures library in high-definition Blu-ray editions. In line with Twilight Time’s innovative limited series concept, just 3000 units of each title will be produced, aimed at the collector/classic film aficionado market, and available exclusively online through www.screenarchives.com, the nation’s largest independent distributor of specialty soundtracks. The November 8th Blu-ray debut of director Cy Endfield’s and special effects master Ray Harryhausen’s 1961 science fiction/fantasy classic, ''Mysterious Island,' will be followed by a new release on the first Tuesday of each month. Scheduled follow-up on December 13th is the original 'Fright Night' (1985), the horror/comedy cult favorite written and directed by Tom Holland and starring Chris Sarandon and Roddy McDowall. Twilight Time—the label that has made a recent splash in the classic film home video pond with the release of such titles as 'The Kremlin Letter,' 'Violent Saturday,' and 'The Egyptian'—is the brainchild of 30-year Warner Bros veteran Brian Jamieson and filmmaker/music restoration specialist Nick Redman. In his long tenure at Warner Home Video, Jamieson initiated and oversaw countless legacy restorations, including the films of Stanley Kubrick, Samuel Fuller’s 'The Big Red One,' and Sam Peckinpah’s 'The Wild Bunch.' Redman, a film historian and Oscar nominee for his 1997 documentary, 'The Wild Bunch: An Album in Montage,' is also a prime mover behind Twentieth Century Fox’s pioneering series of limited edition soundtracks, the inspiration for Twilight Time’s release model. Unlike movies-on-demand offerings, each Twilight Time release is a BD or DVD (not a DVDr) properly pressed from a restored transfer. Each is accompanied by a collectible 8-page booklet complete with original essay, stills, and poster art. And each Twilight Time disc provides, whenever possible, that extra most coveted by cinemusic enthusiasts: an isolated score. 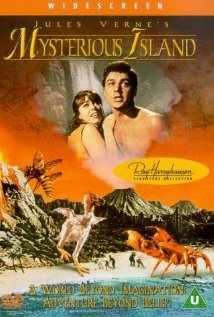 'Mysterious Island' offers a particularly high incentive along these lines, featuring music by pantheon composer Bernard Herrmann. You can find the latest specs for 'Mysterious Island' and 'Fright Night' linked from our Blu-ray Release Schedule, where they're indexed under November 8 and December 13 respectively.